I would like to start this post with an apology for you all. I have been away from my blog now for around a week and a half, this has been due to a few different things that I won't go into but I would like to say how sorry I am. I felt I had to explain before doing anything else because I appreciate everyone who follows my little blog and I felt like you deserved it. Onto the other part of this post, the Origins review! Before I start to talk about the product its self I should explain a little about my skin. I never really had a problem with spots throughout most of my teens, of course I had the odd one but nothing bad. Around the age of 18/19 I stared to get a couple of spots to the right side of my chin and they seemed to just stay. Over time a couple changed to maybe six or more, all in the same area and they just seemed to always be there. They got very large and very sore and left marks and scars on my skin. I then started to get them on the left side of my chin and the same thing happened, a couple turned into a few and there seemed to be nothing I could do about it. After years of trying a multitude of different products to help with them and having nothing work I started to get very down about it and eventually I was referred to a dermatologist. I was given antibiotics and a cream to apply at night, happily I can say that they worked for me! I still get spots but they are smaller and more manageable than they were before. Because of this I thought it was about time I try a spot treatment again to help keep them at bay. 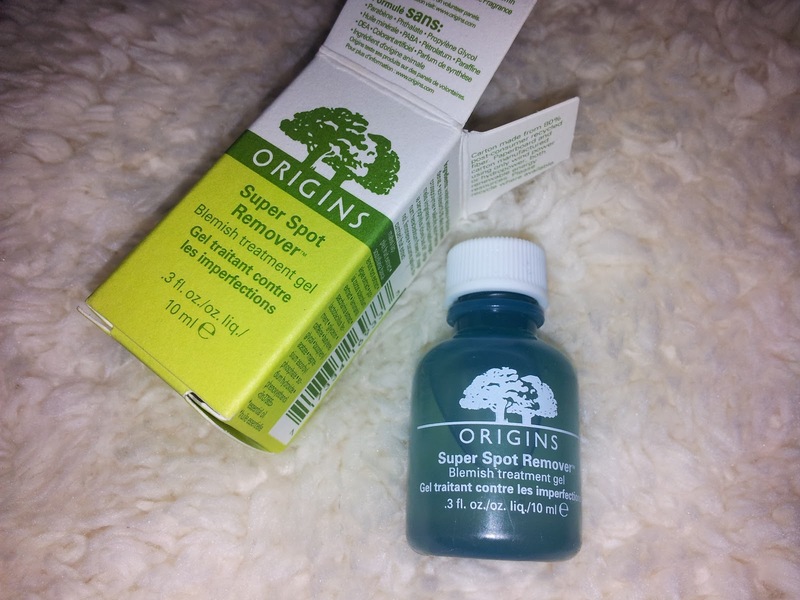 I had read a lot of good things about the Origins Super Spot Remover so I wanted to give it a go. The first thing I noticed about the product was the size of it for the price! I had only ever seen it online so I didn't realise how small the bottle actually was...It is tiny! It is a 10ml bottle for £13 and honestly that really put me off buying it. The girl who served me at the counter explained that the product has a two year shelf life once opened and the reason it has such a long life is because you use such a small amount. I was sceptical about it at first but after getting it home and trying it out I can see what she meant! You add a tiny amount to a cotton bud and dab it on the spot only, not around the effected area as with some products. I have been using it for nearly two weeks now and it looks as if I haven't used any! Origins say that this product will "heal fight and fade it fast" and I would have to say I agree with them. After using it I would say small spots have gone completely within two days and larger spots are dramatically taken down in size to almost being flat to the skin. The product also claims to reduce the redness in the spots and help with the healing of the skin to stop scarring after the spot has gone. Again I agree with these claims! After using it large very red spots are a pale less irritated colour that makes them easier to cover with make-up if you choose too. I am finding that if it is a new spot I am not left with dark marks on my skin where it has been, and as it claims to help with post blemish darkening I have been dabbing it on marks left from previous spots and I can honestly say it is working! The marks will fade over time without the use of any product but this seems to have sped things up a little. I have been using this a soon as I notice a spot break through the skin and it seems to so far keep everything under control. I use it at night after cleansing my face as the product suggests and that is working best for me. I have heard some people say they use it before they put make up on but personally I don't like doing that. Overall I am incredibly happy with this product, I have never come across something that has worked so well and it does it in such a short time. I would highly recommend this product to anyone who has problems with spots! It is the first Origins product I have ever used and if this is anything to go on it is a brand I would like to try more of. Have you tried origins products? What are your favourites?? I will definitely have a look at that mask. If it's as good as the gel then I'm sure it will become a favourite of mine too! Me too, I've been so impressed with this one I want to try a lot more. I also love that stuff! Origins' Checks & balances face wash is great, too.